Can words do damage? For medieval culture, the answer was unambiguously yes. 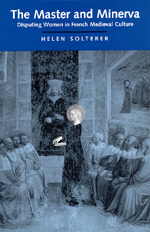 And as Helen Solterer contends, in French medieval culture the representation of women exemplified the use of injurious language. Solterer investigates the debates over women between masters and their disciples. Across a broad range of Old French literature to the early modern Querelle des femmes, she shows how the figure of the female respondent became an instrument for disputing the dominant models of representing women. The female respondent exploited the criterion of injurious language that so preoccupied medieval masters, and she charged master poets ethically and legally with libel. Solterer's work thus illuminates an early, decisive chapter in the history of defamation. Helen Solterer is Associate Professor of French at Duke University.